Flower arrangements that make use of greenery are becoming ever more sought after, and we believe that this can be attributed to the rise in popularity of rustic weddings. However, weddings aren’t the only space in which green floral arrangements can be used to make an impact, as you’ll soon find out if you keep reading. There’s something undeniably charming about a monochromatic green flower arrangement, as green is usually thought of as one of the more restful and relaxing colours. It also symbolises growth and rebirth, which are themes that can speak to one’s wedding. However, if monochrome isn’t your thing, you don’t have to shy away from using a combination of flowers and greenery to have the perfect bouquet of flowers. Brightly coloured blooms will act as a pop of colour to the background of green leaves and flowers and can bring balance to the overall aesthetics of the flower arrangement. Bells of Ireland – To add height and variety to a flower arrangement or bouquet, consider using these tall-stemmed, deep green blooms with their bell-shaped leaves that often conceal the tiny flowers that sprout from their stems. Anthurium – This large, leathery petalled flower immediately makes one think of an island holiday, making them perfect for a beach wedding or tropical-themed event that you’re hosting. Green Roses – Is there any flower that’s as classic and timeless as a rose? With a wide variety of colours, roses offer elegance while green roses add a little something extra to the mix and are sure to garner attention. Weddings – If your wedding is centred around earthy tones, rustic appeal, and natural charm, you can’t go wrong with green flower arrangements for your bridal bouquet, centrepieces, and other floral décor. Consider incorporating long, drooping stems of greenery into your bouquets, or an explosion of green peppered with brighter flowers in your arrangements. Themed Events – One area in which green flowers and leaves truly shine is when they’re used for themed events. Think tropical-themed parties and see if you can source greenery that’s indigenous to tropical areas to add authenticity to your event. Around the House – If you’re the kind of person who’s known for always having flowers throughout the house but are getting bored of rotating between the same blooms, consider green floral arrangements, you could also mix up your flower arrangements with some succulents to add variety. They’ll be a welcomed change in your space and are sure to bring an air of peace to the home. 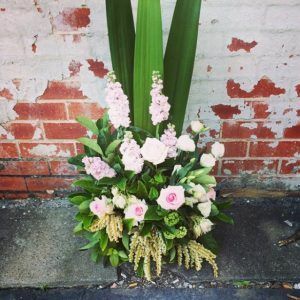 If you’re looking for green floral arrangements for your wedding day, or just to add some colour to your home, contact Best Buds today, and we’ll provide you with the best flowers on the Australian market.